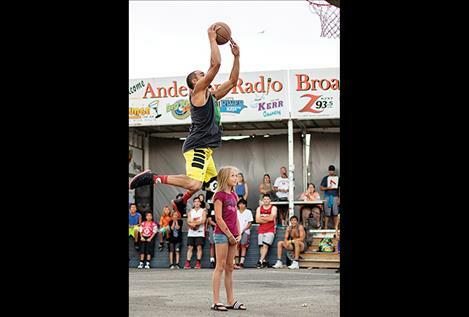 Deon McLaughlin shows off his skills. Will Mesteth Jr. makes a move to the hoop. 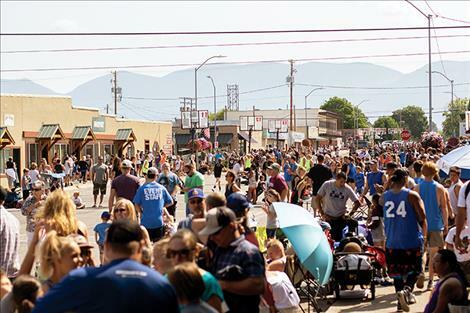 POLSON – It has become customary for one weekend every summer, the downtown streets of Polson belong to the echoing sounds of whistles, basketballs bouncing on pavement, the swish of the net and the occasional loud cheer from the crowds. 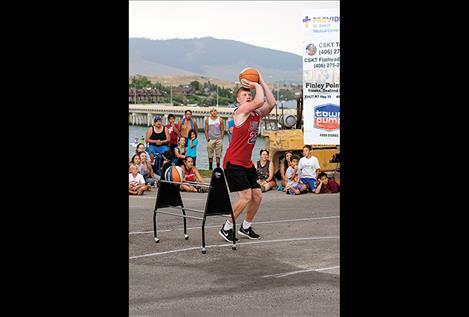 This year marked the 26th year that Polson’s downtown streets has hosted the competition known as the Flathead Lake 3-On-3, where teams compete against one another in 14 divisions depending on age and skill level, and winners are awarded bragging rights until the following year. 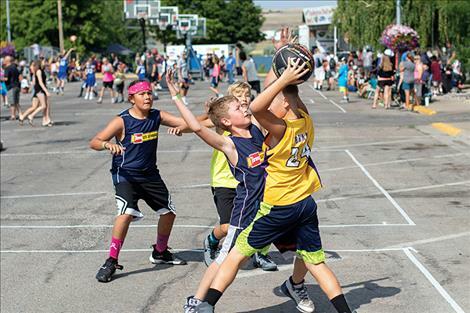 Rich Forbis, co-founder and tournament organizer, said about 225 teams had signed up to put their skills to the test in hopes to call themselves the champions in this year’s two-day tournament which started on Saturday. On Saturday night, despite blustery conditions, the rain held off long enough to name Megan Baxter the ladies three-point champion and Matthew Rensvold the men’s three-point champion. Rensvold, a red shirt freshman tight end for the Montana Grizzlies football team, donated his winnings to the Polson High School Athletic Department. Once again Deon McLaughlin out dunked everyone to take his second consecutive slam dunk championship. 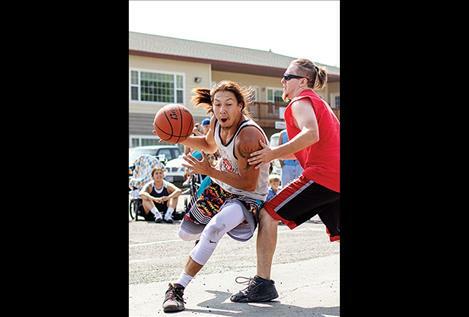 Perhaps the most heated of games came in the men’s open elite and recreational championship rounds on Sunday. 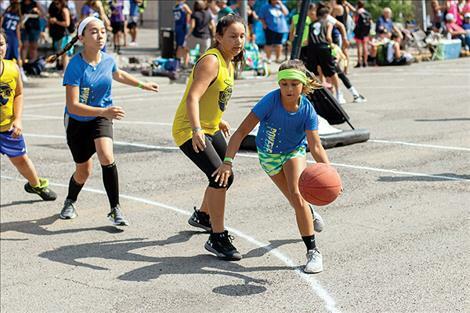 The division is often comprised of former high school and college athletes, all of whom bring their burning competitive spirits to the asphalt courts. The winning teams were in the girls 5-6 406 Wild, boys 5-6 Bulldogs, girls 7-8 Swishers, boys 7-8 Butte IDC, girls 9-10 Swat Team, boys 9-10 Off in the Woods, girls 11-12 Pikuni Nation, boys 11-12 Ronan 1, women’s open Legends, co-ed Dawgs, 6’1” and under elite Run and Gun Blackfoot, 6’1” and under rec Poi Time, men’s open elite Tire Depot 1 and men’s rec Tire Depot 1. 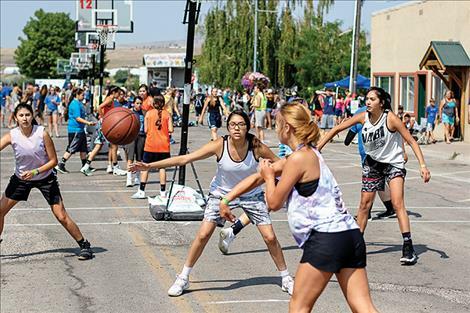 Tournament proceeds support and benefit local projects and organizations.